Date: 30. 7. 2017 – 12. 08. 2017. Event description: SCI Switzerland organizes a dance and theatre week for kids from the asylum seeker center in Reconvilier together with children living in the village. The aim of this integrative project is to give the possibility to kids from refugee centers to have a rich exchange of experiences with local kids and to improve their local language skills in a creative context. This will be accomplished with a mix of dance and theatre playing activities. At the end of the second week, there will be a presentation of the work. About 25 to 30 kids between 6 and 13 years old will participate in the project. The connection between ”A Route to Connect” and this workcamp is established by sharing the stories from the project through print magazine with the volunteers in this follow up project. 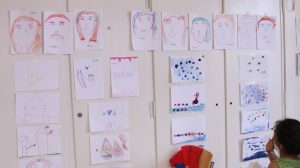 By organizing this new project SCI Switzerland confirmed it’s commitment to working with refugees while pointing out the importance of creating opportunities of integration and connection with the local population – especially through theatre and games. It’s efficiency was also apparent in ”A Route to Connect” project, where clowning performances in refugee camps were essential, when it comes to creating connections with people in the camps and within the local community. You can check out the magazine here!